Heart disease remains the number one killer of women, outpacing breast cancer, diabetes, and stroke, with one in four women receiving a diagnosis in her lifetime. And the problem is only getting worse. Dr. Mark Menolascino has been on the front lines of cardiac research for most of his life, running a highly successful clinic where he takes a holistic, personalized approach to reversing disease and jump-starting health. Most of his patients are women struggling with symptoms and illnesses that stem from the most important, life-giving organ in the body: the heart. 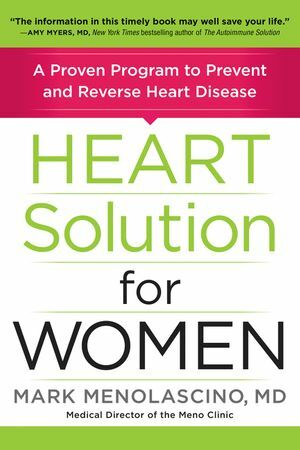 In Heart Solution for Women, Dr. Menolascino explores the many ways our hearts are the pathway to overall health. While the classic risk factors for heart disease—obesity, high cholesterol, high blood pressure, stress, and poor diet—are critical components, symptoms of the disease manifest differently in women’s bodies and can go misdiagnosed for years. They include depression, anxiety and panic attacks, poor sleep, and widespread pain, and can be masked during pregnancy, post-pregnancy, and menopause only to appear with great force later in life. Featuring the latest research on gut, brain, and hormone health and including answers to the most common heart-health misunderstandings, Heart Solution for Women finally gives women the tools to succeed, feel great in their bodies, and add years to their lives.